Apex Precision Technologies of Camby, Ind., produces large parts for many familiar off-highway vehicle and automotive suppliers, and specializes in differential housings, transfer cases and axles. 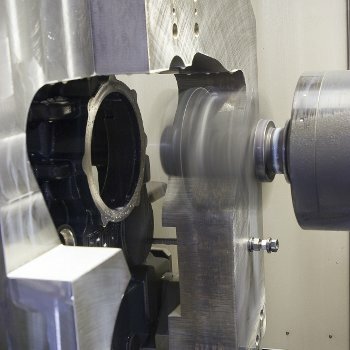 Like many companies today, Apex customers want parts cheaper and faster and do not care if material costs have gone up. It is required to produce large quantities of parts in small batches. To keep profit margins from shrinking, Apex uses combination cutting tools and custom fixtures. The company needed a flexible machining solution to help the shop meet lean manufacturing goals that call for reliability, versatility and flexibility in programming and machining. As part of that goal, it also needed to make the most of the large, heavy custom tools it uses to help it meet its client’s just-in-time requirements. This flexible machining solution has provided Apex with higher spindle utilization and decreased cycle times with little operator intervention. Scrap rates have decreased, tool life has improved and the company is experiencing fewer tool changes, along with lower tooling costs. Those capabilities on the a81 machines, in particular, enable Apex to easily handle the long and heavy tools with which it works. Without the flexibility, speed and reliability of the Makino machines, company officials say they would not be able to use these customized tools and fixtures. They are able to gain deep access into holes or pockets, reach through window fixtures, moving farther from the center of the pallet and farther up in the Y-axis while retaining needed accuracies.